Environmental water was provided to 2,840 hectares of Gunbower Forest in 2015–16 including to 95 percent of the forest's impermanent wetlands. 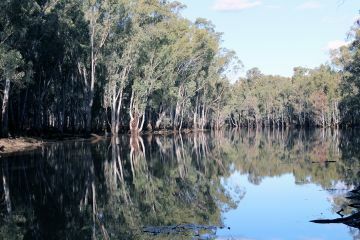 Environmental watering also benefited 14 percent of the forest's river red gum trees. "Vegetation surveys in watered wetlands and under river red gums demonstrate strong aquatic plant growth, especially in areas where plants were protected from carp," said North Central Catchment Management Authority's (CMA) Kathryn Stanislawski. "There is healthy growth and improved condition of river red gums in parts of the forest that received environmental water. The condition of river red gum trees in parts of the forest not watered is comparatively poor. "Fish surveys also identify mass recruitment of small-bodied fish in floodplain wetlands that received environmental water." Environmental water is also provided to Gunbower Creek to support a diverse native fish population. "We maintained moderate-to-high flows through the creek in spring and summer to support Murray cod spawning (when fish release fertilised eggs), recruitment and survival. Low flows were maintained through winter to provide habitat for Murray cod and other native species outside the irrigation season," Kathryn said. "Fish surveys recorded Murray cod of mixed ages for the first time in 10 years, including 'young–of–year' [fish under one year old]. This indicates recent strong recruitment and fish surviving to maturity." Gunbower Forest is very important to the local community for recreational, social and economic reasons. It is of particular importance to the Barapa Barapa and Yorta Yorta Traditional Owners. Yorta Yorta and Barapa Barapa have established a self-determined monitoring program focused on cultural values. 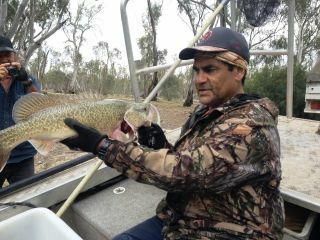 In 2015–16, Barapa Barapa and Yorta Yorta Traditional Owners, North Central CMA staff and vegetation and fish ecologists joined forces to examine how the forest had responded to environmental watering and to share the results of cultural health site surveys, fish surveys and plant surveys. Traditional Owner and North Central CMA team leader Sharnie Hamilton said, "Water is a key element for our cultural sites, not only our cultural sites but the environment. The environment is what makes our cultural sites. We need water to these places so we can bring back food and medicine plants, because these plants are becoming very rare out here."